I peeped some bagels hiding in the back of our freezer this morning when I was grabbing the coffee, and my brain immediately was like “ding-ding-ding – THAT’S GONNA BE BREAKFAST”. I love bagels! Do you? I can never pass up the chance to gobble one up. Like, never-ever-ever. My hips don’t lie. Are you guys into the runny yolk egg trend? I loooooove it. I think a runny egg on pretty much anything – except like, ice cream… – is pure heaven and bliss. BUT! I know a lot of people – including the very handsome but picky man I keep – are not into the liquid yolk. So! 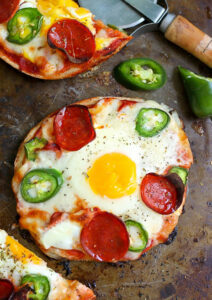 My point of this whole runny vs firm ramble is you can bake it either way when you make your little bagel pizza. If you want a runny yolk, 16 minutes, baby. Like it firm? 20 minutes and you’re solid. 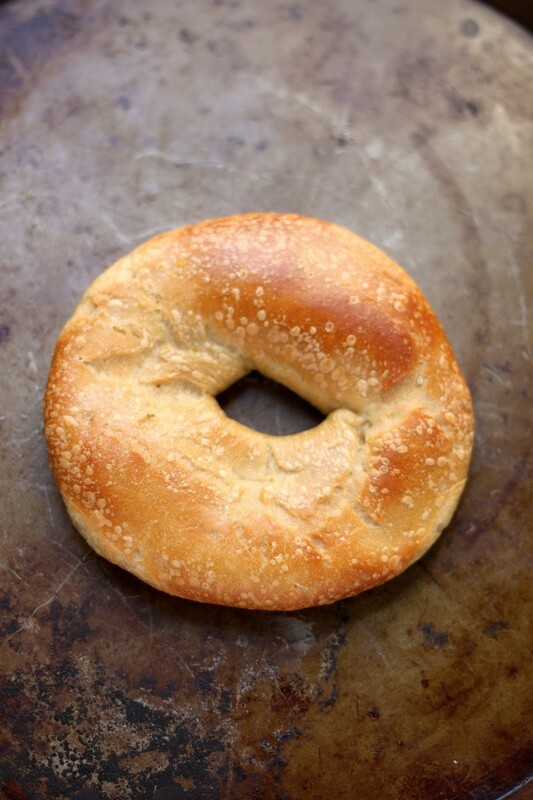 This recipe starts with a – wait for it – BAGEL! This is actually a flagel. Uh huh. Flat bagels for the win! Less bread = MORE cheese. Yay-ah. *Regular round bagels will work!!! Perfectly. Then we’re gonna get down to the serious business: toppings! We got our sauce and cheese – pizza staples! And add some slivered jalapeños and pepperoni. Amen. 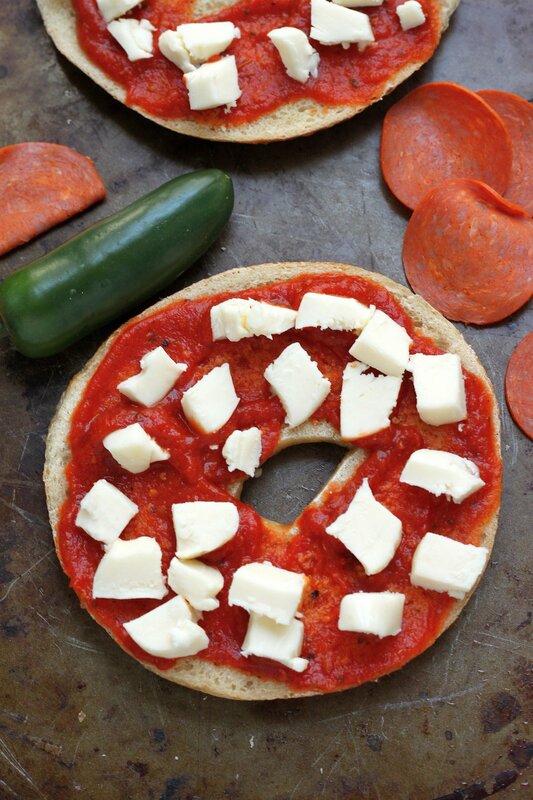 *You can add whatever the heck you want to your pizza bagel. W-h-a-t-e-v-e-r! Now. The EGG. I love the egg. Add the egg. It makes it breakfast. It makes you happy. Then we just bake it up, and vwah-la! 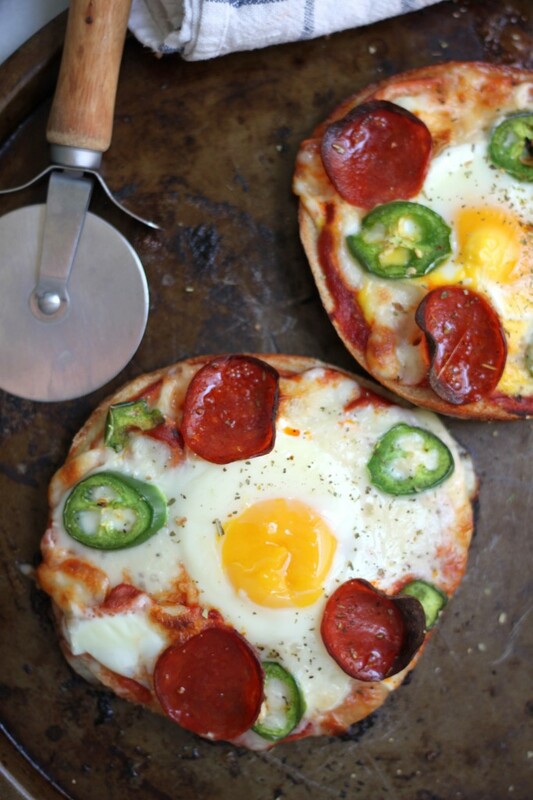 Breakfast Pizza Bagels! Yippee-yahoo-and yay! 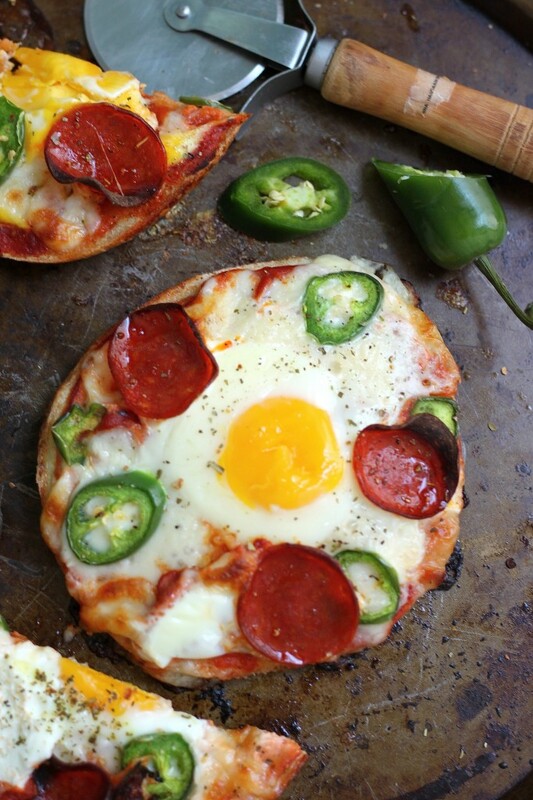 An easy and fun recipe for Breakfast Pizza Bagels! Preheat oven to 400 degrees (F). Line a small baking dish with parchment paper; set aside. Spread 1 tablespoon of pizza sauce around each side of the bagel. Top each half evenly with the cheese, then add the toppings! Top each egg with a little fresh ground black pepper. Love love love bagels, and I’ve been deprived for quite some time. I’m holding out for a few more weeks, but when I give myself the go-ahead these will be first on my list! Love these!! Pizza bagels happen all the time around here and an egg is just genius! Breakfast is the most important meal of the day … and it just got so much more exciting. Love this! I’m actually angry that I’ve never thought of this before! Can’t wait to try this with bacon and maybe a white sauce of some sort (possibly sausage gravy if I plan on running…). Oh YUM! That sounds epic. 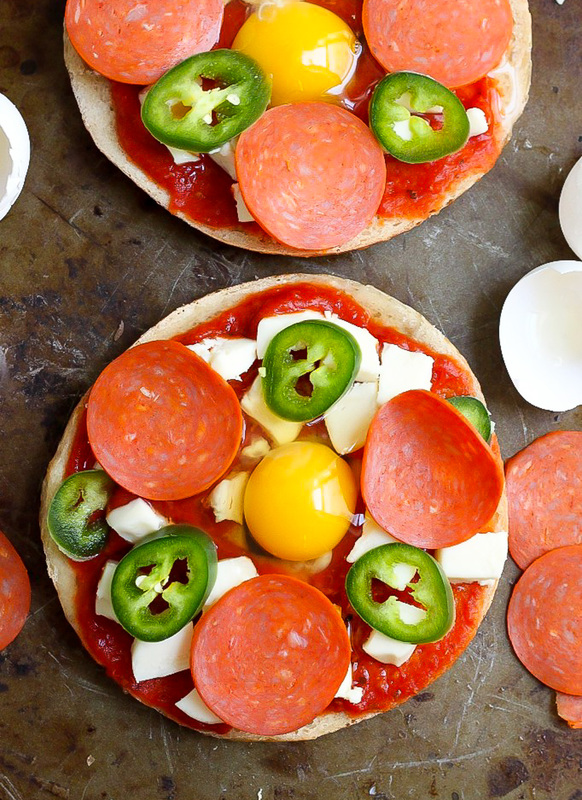 These bagels are so fun, great savory breakfast idea! I just feel like you’re the coolest person ever. Lol a flagel! These look super delicious! 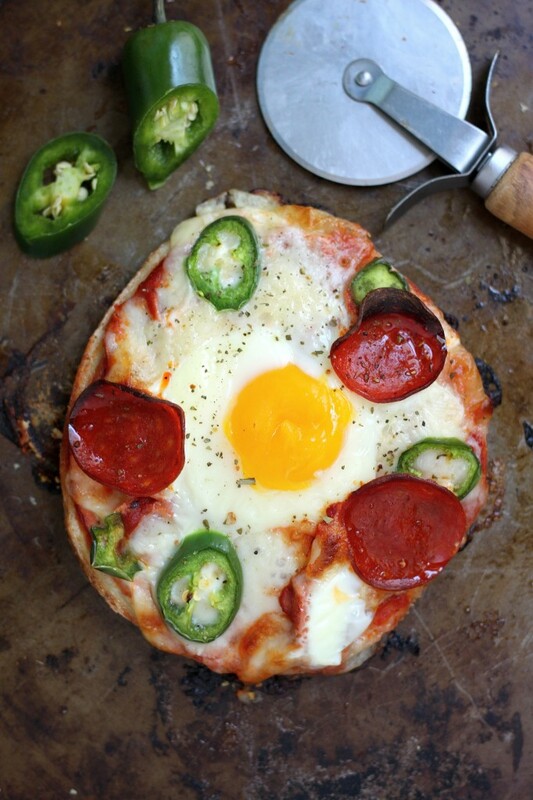 Can’t say making a breakfast pizza bagel ever occurred to me…but now I can’t stop dreaming of different ways to eat pizza for breakfast!!! Move over oatmeal, I was sick of you anyways! 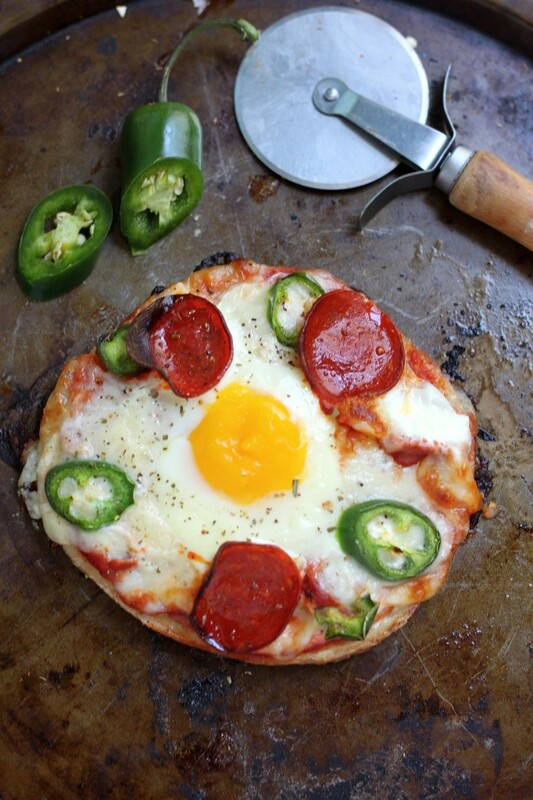 Yum, that looks so good, if only I had some bagels around… I’m wondering though, doesn’t the egg white go down the hole? Make sure your egg whites have a place to go. My egg whites went all over the pan. Praying this isn’t an epic fail. Hi Sarah. So happy to hear you enjoyed the pizza bagel 🙂 Parchment paper is also a great way to make cleaning up easy – and it tends to “stick” less than foil. i want to make these to send to camp with my husband. I was going to cook them as directed -16 minutes and then wrap with foil for the men to heat up over the fire. I wonder if I would have to put the top of the bagel on to avoid the cheese and egg sticking and going everywhere?